We aim to promote international cooperation and solidarity in Canada and to encourage people, young and old, to participate actively in the development of their society and the world. We want to inform and educate people about the issues and challenges of international development, while providing opportunities for community actions. 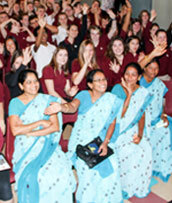 We are pleased to offer workshops and presentations to your school or community group. If you would like us to visit you, or if you are interested in volunteering with us, please contact us to learn more. They’ve been doing it for twelve years! 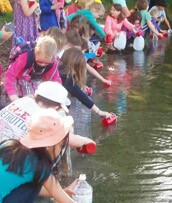 Every spring students from Fernwood Elementary School in Salt Spring Island, BC, walk to a nearby lake, collect water and carry it back to school. Robin Andison started the tradition and still talks the talk. This “Great Walk for Water” has a purpose and she makes sure of it, year after year. Why are they keeping at it, you might think?